NEWPORT, Ky. -- On Oct. 12, 2012, Shayna Hubers wrote text messages to her boyfriend saying that she woke up in the middle of the night with chest pains, and her mother drove up from Lexington to help her. Hubers was triaged and underwent an EKG at the hospital, she texted to her boyfriend, Ryan Poston. She wrote that she was going to see a specialist and described the types of medicine she was being prescribed. Later that day, Hubers shot and killed Poston in his Highland Heights condominium, according to police. 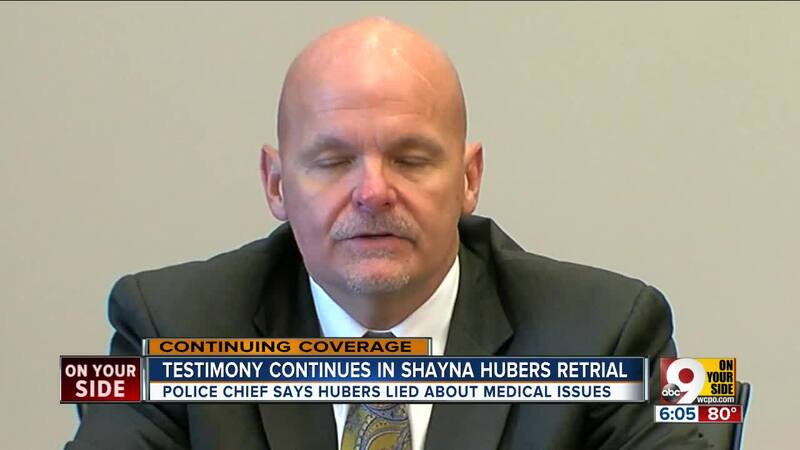 But during her two-and-a-half hour with detectives after the shooting, Hubers never mentioned her heart problem from that morning. That's probably because she had made it up, Highland Heights Police Chief Bill Birkenhauer said. Birkenhauer testified Monday in the fifth day of Hubers' retrial in Poston's death. He said Hubers sent the messages to Poston while doing Google searches on high blood pressure and heart disease. "For instance, she'll search medication for left ventricular hypertrophy, and right after that she sends a message to Ryan Poston saying she had left ventricular hypertrophy and the medication she was going to have to start taking for that," Birkenhauer said. It was routine for Hubers to message Poston frequently, according to Birkenhauer. He said Hubers sent Poston tens of thousands of social media messages, but Poston would rarely respond to them. "If he was trying to break up or move on, she would send him 100 messages to his one response," Birkenhauer said. "Many times he would just turn his phone off." Hubers even hacked Poston's Facebook account to unfriend people and send messages to others, Birkenhauer said. Even with the hacking, he said it was the volume of messages that surprised him. "All in all, I would put the number of individual messages at — pretty much, you can't count them — I would say between 50,000 and 100,000 messages," Birkenhauer said. 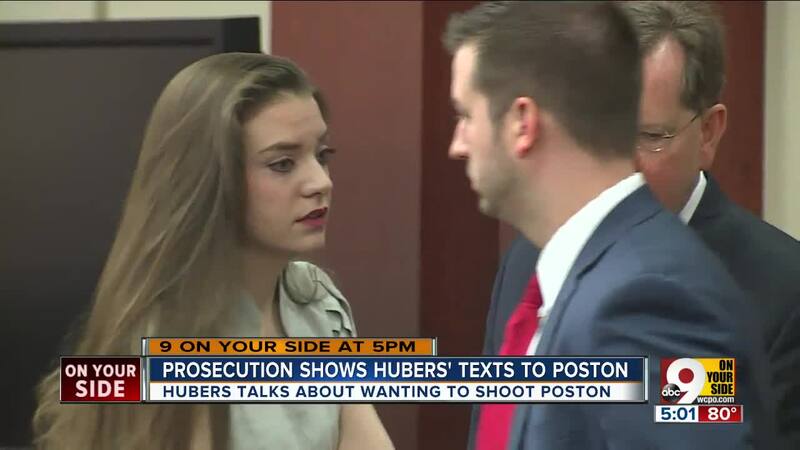 Other times, Hubers would use a friend's phone to send text messages to Poston. "You're just a horrible attorney," she wrote in one, according to Birkenhauer. "Ha. You lost a client and didn't content. Wow. Not easy, just stupid. Goodbye." On the night Poston was killed, he had been scheduled to meet Audrey Bolte, the former Miss Ohio, at a United Dairy Farmers and then go to a bar. Hubers knew Poston was supposed to meet her that night, according to Birkenhauer. He said Hubers friended Bolte on Facebook two days after Poston became friends with her. 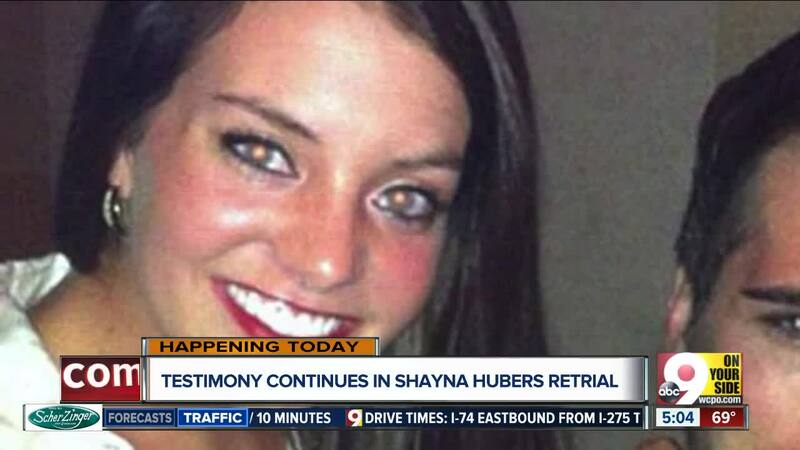 The prosecution has alleged Hubers murdered Poston after he tried to end their year-and-a-half relationship. They pointed to the testimony of Poston's father, testimony from Poston's friends and Hubers' own admission to police about shooting and killing Poston. "I asked him what's going on, and he said, 'Dad, she won't leave me alone. She won't leave my home.' I said to him, 'Ryan, that's your home.' I said, 'She needs to leave your home,'" Poston's father, Jay Poston, said Friday. He described how he heard Ryan's phone pinging from text messages "all night long." Ryan Church, a friend of Poston, testified on Thursday, saying Poston was planning on breaking-up with Hubers. "He had said he was trying to end the relationship, that he didn't want to date her anymore, but just couldn't seem to get away from it," Church said . Ten days before the shooting, Hubers texted a friend about going to the shooting range with Poston, Birkenhauer testified Monday. "A part of me wanted to turn around and shoot him," he said, reading Hubers' text. "I wonder why he's taking me on dates and stuff. LOL. I'm not going to turn down learning to shoot a gun. Haha." The defense team is expected to claim Hubers was protecting herself when she shot and killed her boyfriend Ryan Poston. She told investigators that she thought he was going to shoot her, and that she killed Poston on self-defense. Her attorneys are expected to build their case for self-defense starting this week. "He was throwing me around the room," Hubers told police after the shooting. But Birkenhauer refuted those claims Monday, based on evidence found at the scene. "There does not appear there could have been any kind of struggle in the middle of that living room," he said. The furniture was intact. The televisions were still on their stands and covered with dust. "It's obvious that nobody even brushed against the TVs because there would have been streaks in the dust on the screens and the sides," Birkenhauer said. Last week, jurors heard testimony from two of Poston's neighbors, who said they heard the shots, but no struggle. Birkenhauer said Poston was seated at the table with his legs crossed under it when he was shot.